How finding perfect romantic gifts can spark your love life? It is not a secret that a romantic and fulfilled love life has to be maintained. Leaving your love life on autopilot would guarantee a crash soon or later. Your approach, beliefs and how you are expressing them in a relationship are crucial. Giving gifts are only a small token of appreciation, but they do bring a special touch. Falling in love and feeling loved is an amazing and powerful energy that embraces us in its kind warmness. That loving energy creates joy, fills your heart with happiness, leaving you with an extraordinary ability to do anything you want to accomplish. It is an incredible and one of a kind feeling but what follows after? It is hard to foretell. Love is unpredictable, mystical and can vanish without warning. Enjoy and cherish the person in your life and don’t forget how and why you fall in love. Don’t let the daily routines get in the way of how you feel about each other. It’s is not always easy to keep the sparks coming, but you can make sure that they will not fly away by staying aware, feeling thankful and make little loving gestures like thinking of surprising your significant other with unique romantic gift ideas. Gifting presents and enhancing them first with positive and heartfelt emotions will lead to a genuine sense of appreciation and affection. 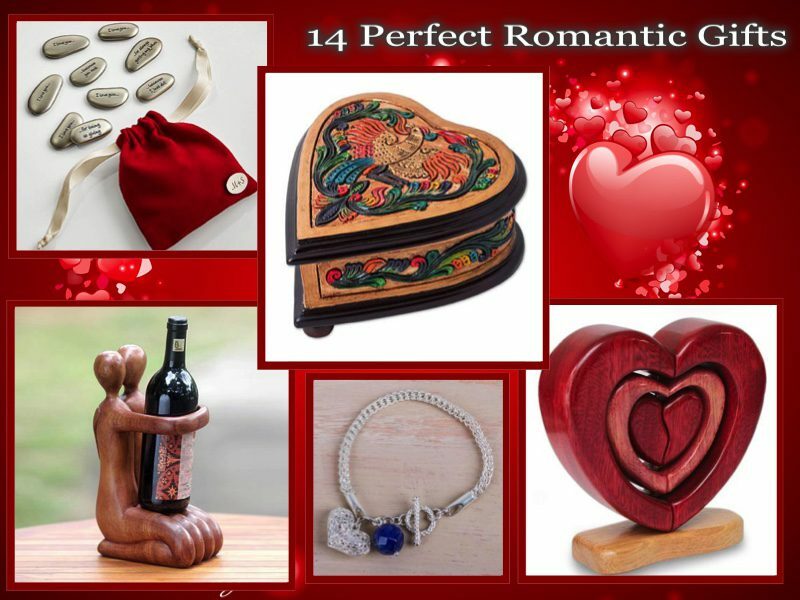 Unique romantic gift ideas would definitely create a special atmosphere as you are showing your loved one that you took the time not only to find a romantic gift but that gift is as unique as the person next to you. Gifts with or without occasion bring joy and lift your spirit. I am one of those people who love to select unique gifts for the people I love and enjoy very much seeing how happy they are. Sure gifts are material stuff, but you took the time to find them using your loving energy and creative mind and that’s what counts. Pausing from your busy life and taking the time to deliver a pleasant surprise to another human being is an incredible sensation. So let’s try now and search for perfect romantic gifts and find the one that would leave a lasting impression and sweet memory. Unique handmade jewelry ideas are always a great way to start exploring your perfect present options. 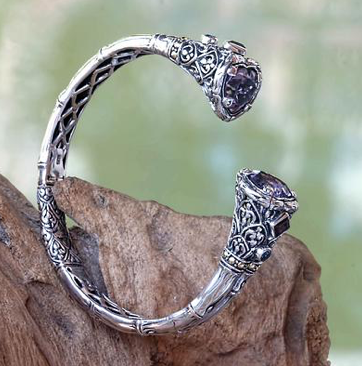 This beautiful cuff bracelet is designed by Bali artisan Kadek Hendra. Blue topaz, garnets, and gleaming 18K gold accents complete this extravagant design. Two hearts meet under their loving lilac light. Truly a gorgeous piece of jewelry! 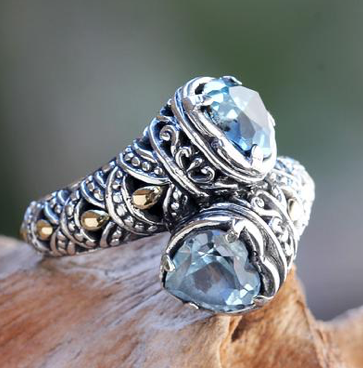 Blue topaz hearts tangled in the passionate design by the same Bali artisan Kadek Hendra. This lovely and unique ring would definitely wow your girl! Carmen Anocibar from Peru is the incredible designer of this elegant necklace. Crafted by hand, celebrates love and affection radiating with beauty and purity. 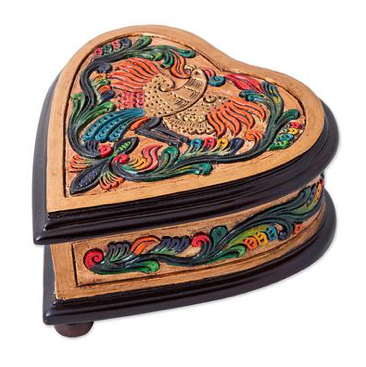 Bright and beautiful, this handmade multicolored jewelry box makes one great and original gift! Kalvin Maguiña from Peru is the creator of this stunning art. With red velvet lining, removable inner compartment and an elegant mirror the box are sure to lighten any room. Modern and sensitive, the design of this lovely bracelet is by Rider Fernández. 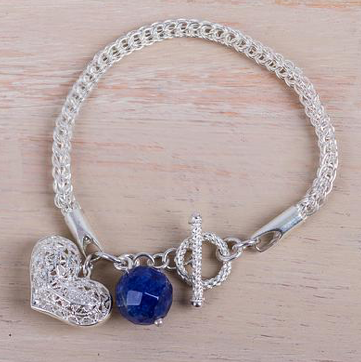 Beautiful blue sodalite and curved pendant shapes in a rounded heart make this Peruvian charm bracelet and excellent gift choice! 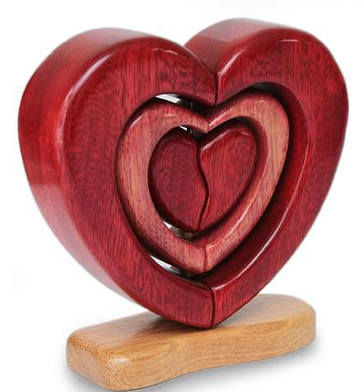 The three sensual hearts in the sculpture by John Barrow are handcrafted with Peruvian woods and colored in several shades of red. Original and artistic, this art symbolizing love is a truly romantic gift present! The unique design of this sterling silver necklace embraces romantic concept and style. The Thailand artisan Narinee crafted the pendant by hand creating a magnificent effect with oxidized contrasts. Those were just a few unique and romantic selections for the woman in your life. 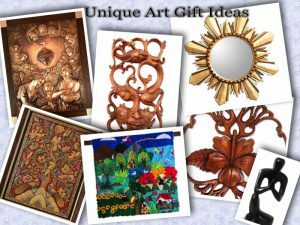 I don’t want to overwhelm you with ideas as I am sure your imagination would help you select that perfect present. 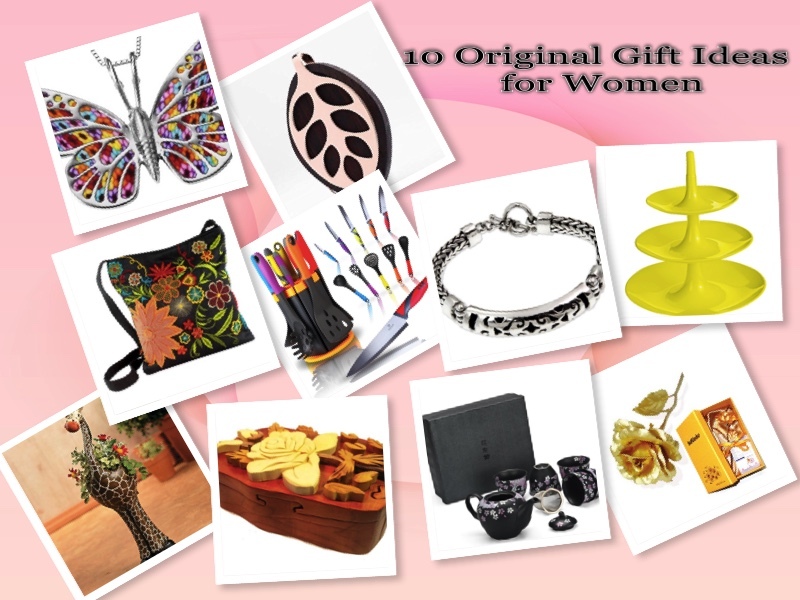 You can also check my previous posts below to see if you can find what you are looking for and also discover some more incredible and unique gift options. 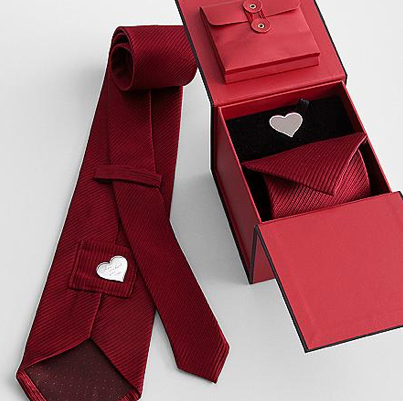 Now let’s take a look if we can discover interesting and original romantic gifts for men. 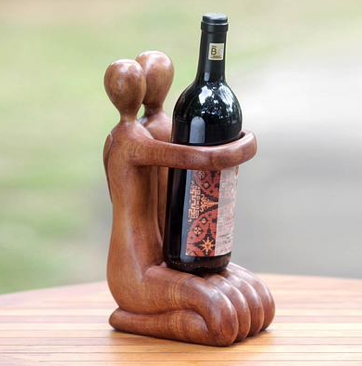 A kneeling couple kiss and hug ready to share a nice bottle of wine. Wonderful sculpture by Wayan Rendah is extending a gracious invitation. Perfect present for the man in your life, especially if he happens to love wine! 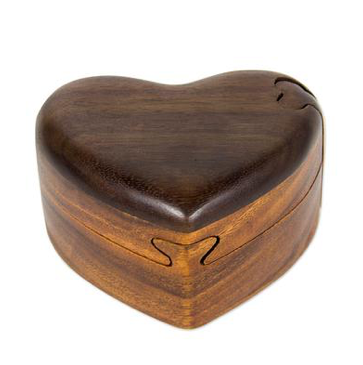 This decorative box holds love’s puzzling emotions. The box has four parts carved of suar wood and the top of darker sono wood. The artist name is Eka from Bali. Beautiful and creative way to fill this heart puzzling box with your warm feelings and give it to the man responsible for your happiness! 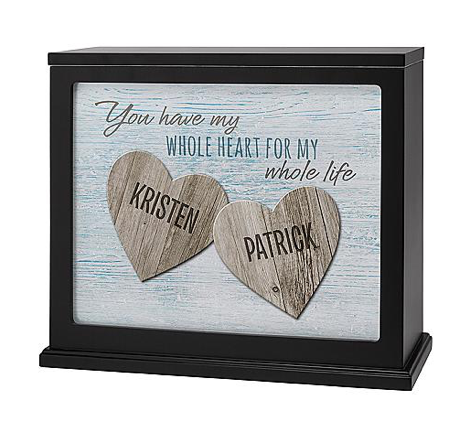 Personalized romantic gifts are always a warm touch for your heart. This beautiful accent light it’s made from wood and acrylic. You can personalize it with two names up to 12 characters. Includes 7 Watt type C bulb and it will sure deliver a warm ambiance! The tie comes with a black trim box. Isn’t this a sweet idea for a romantic gift? 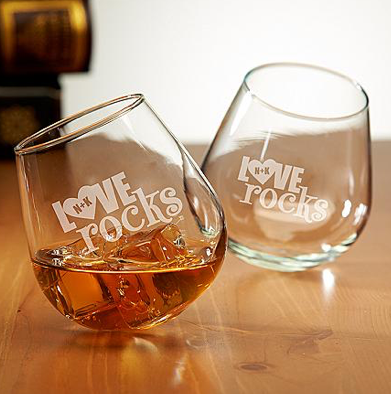 Personalize and ready to rock with love! The swirling motion improves the oxygenation of the spirits, creating a pleasurable aromatic drinking experience. 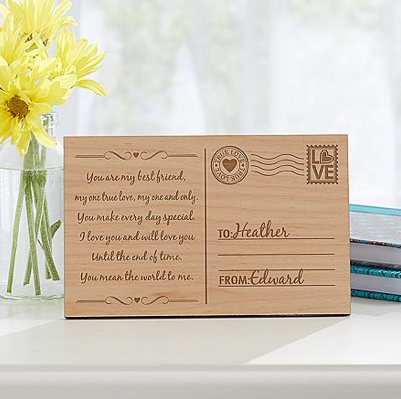 What an inspiring idea to have a memorable and lasting message carved into a postcard! Not just any postcard but the one made of wood. Add your two names and 4 to 6 lines of a message and the card is ready for a tabletop display or wall mount. These nickel-brushed stones are not for skipping! They will for sure send your sincere message to your loved ones. 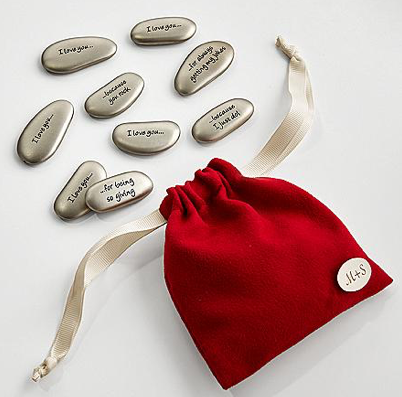 The stones feature 9 of the many reasons you adore him, engraved on them. Thoughtful, original and truly unique way to show your feelings! 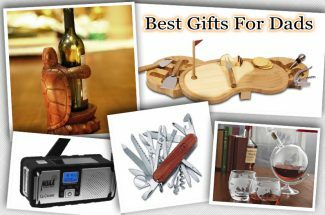 While these were just a few ideas of perfect romantic gifts, I am positive that you can discover a lot more if you read my other articles featuring unique gift ideas for men. Take a look below as I have included them for your convenience. I would love to see your comments on your ideas of unique and perfect romantic gifts! After reading the article, which gift did you like most? 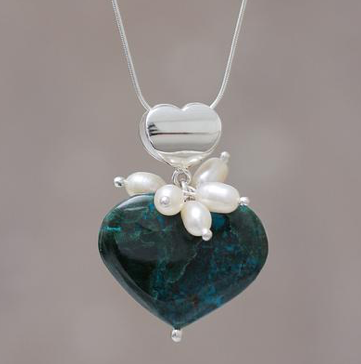 The â€Spectacular Romanceâ€ Sterling Silver Heart Necklace is absolutely divine, all these gift ideas are beautiful but that is definitely my favourite. I don’t think I can wait till valentines day I may have to start making hint starting now. ~I also love the hidden message tie, its such a clever idea. Glad you enjoyed the selections of gifts! 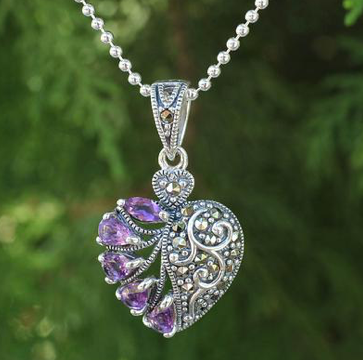 You are right, The â€Spectacular Romanceâ€ Sterling Silver Heart Necklace is one of a kind! Thank you for reading and commenting! Hi Lena, Great site with beautiful jewellery, I love all the pieces, I’m glad I got a chance to see it. I love the men’s gifts too but my guy is your “rough, tough, blue collar” kinda guy. I would love to see something or even get a suggestion on what I could get for him. He doesn’t drink, and he’s definitely not the tie wearing type (Too bad cause he looks good in one) but I’m always stuck on what to get him that would be different but sweet and romantic. I definitely agree that doing sweet things for each others keeps the spark burning bright! Hi Mel and thank you for stopping by and commenting! I am glad you loved the gift selections. 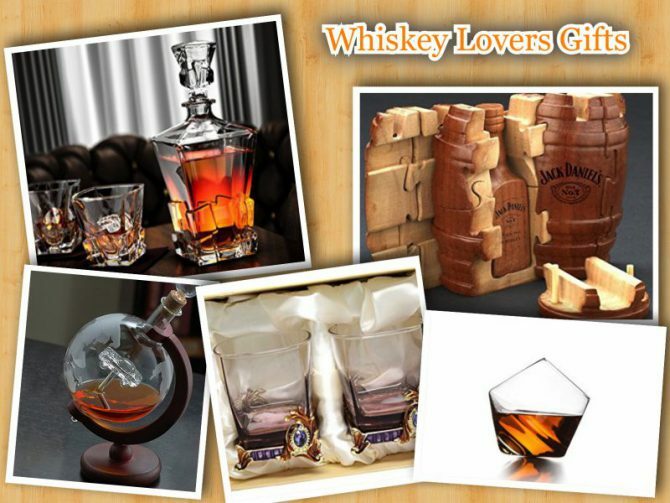 I do have some interesting ideas for your ”rough, tough blue collar” kinda guy:) Check my previous posts (I will provide you with the links) as I think that few of the gift selections there would be a great perfect gift for your man – https://mostuniquegifts.com/discover-your-unique-g… and https://mostuniquegifts.com/10-awesome-unique-gift…. Let me know what you think or if you prefer we can brainstorm together after I find out what are his interests. I am sure we can come up with some really great ideas! And yes, St. Jude has a special place in my heart as they just amazing because of what they do for children!